Toad is a 5-year-old dog like no other. She was born with a condition where instead of having two ears and one mouth, she has two mouths and one ear. The second mouth, which has teeth and salivates, is located where her right ear should be. The peculiar pooch belongs to Heather Hernandez, the founder of Mutt Misfits, a charitable rescue center for animals with major medical issues. Toad was a stray that was taken to the Oklahoma City Animal Welfare Shelter. There they discovered the second mouth. She was then moved to her now permanent home. The second mouth doesn’t function as a typical mouth as it doesn’t open or close. Toad has a limited sense of smell, hearing, and sight due to the misalignment in her skull. 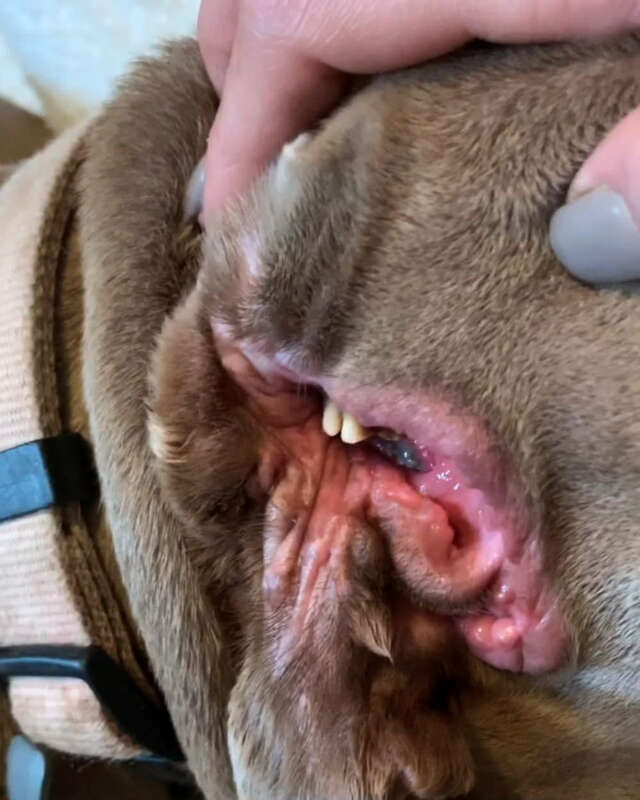 The secondary mouth rarely causes pain, but during an inspection, the vets at the center discovered a few cracked teeth that were likely causing pain to the dog. They were removed and the pooch is feeling better. Mutt Misfits is home to many pooches that are in need of particular attention. Hernandez founded it because there weren’t many organizations that focus on special need pups.